New Oktoberfest t-shirt design for 2014. I decided that my very first tshirt design needed an update for 2014. So here it is along with other holiday designs. 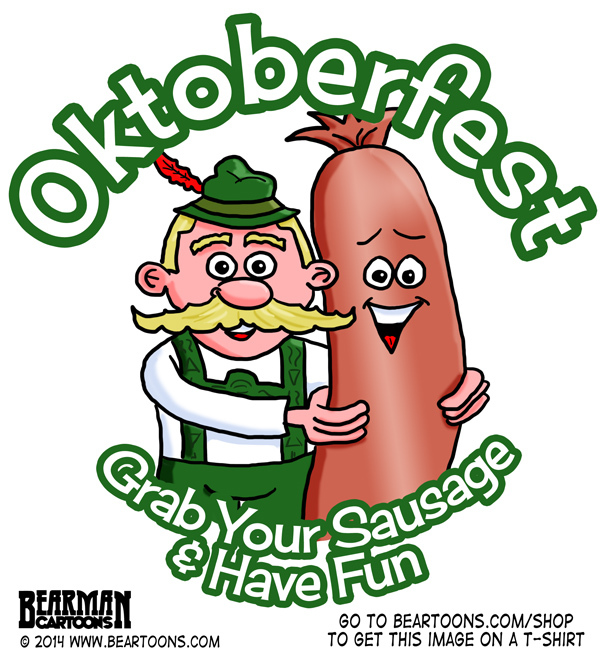 So when it is time for Oktoberfest whether in Munich or Zinzinnati (Cincinnati), it is time to “Grab Your Sausage and Have Fun” Because what is funnier than a man in Lederhosen grabbing an oversized chunk of meat. Of course saying “Wienerschnitzel” instead of “Sausage” would have been funnier but they are two completely different things. In addition to my cafepress store, I also added this design to my Society6 site in case anyone prefers their shirts. Aha! That’s a great shirt, very fun! When is Oktoberfest in Cinci? I might have to actually attend this year. It seems like Oktoberfest comes around earlier every year. I hope to see lots of these shirts in the long lines for the port-a-potty. What Oktoberfest do you attend? Bwahahahahahahahaha. Grab your sausage and have fun. My mind went right in the gutter. First I’ll have a couple of beers and then it’s sausage-grabbing time! Fantastic design! You’d better keep your hands to yourself! I do but Zazzle is so hard to maintain a store look and update with new products that I don’t update it often. That is an excellent design, Bearman! So Funny! And it bring me back to those memorable times in Germany and the ever fun Oktoberfest! Wooohoooo! Everyone grab a sausage! Ah Munich, that country just south of Germany. That is seriously how people here in northern Germany feel about Bavaria. I don’t know how you could market this to Germans but I bet your design would do well here. Well you saw it so the rest should be able to jump on board.